BOSTON (AP) -The Montreal Canadiens moved back into first place in the Eastern Conference, yet their attention was still focused on the team they just beat. Alex Kovalev had two goals and an assist, and Carey Price made 34 saves to lift the Canadiens to their 10th straight victory over the Boston Bruins, winning 4-2 on Thursday night. Montreal has won all seven meetings this season, and tied a franchise record for the most consecutive wins against Boston. That mark was set in the 1944-45 season. "Some teams just play well against other teams, and that's just the way it goes," Price said. The Canadiens moved one point ahead of the idle New Jersey Devils in the race for the top seed in the East playoffs. Boston has one more chance this season to beat the Canadiens, and that comes Saturday night in Montreal. "We are playing against them the way Ottawa plays against us," Kovalev said. "It's still just two points." 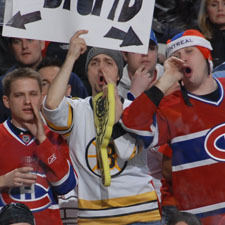 The Bruins also are perplexed about why this Original Six rivalry has been so one-sided lately. "The onus is on us to change this," defenseman Aaron Ward said. "It sounds bad to say, but I thought we were better against them tonight. Shame on us if we are not ready for them on Saturday." 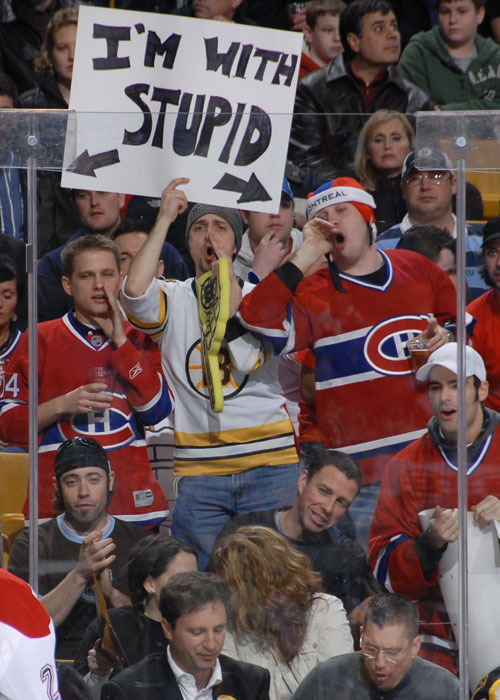 Boston's home arena was about half-filled with Canadiens fans, and they could be heard from the opening faceoff. Kovalev gave Montreal a 2-0 lead with a pair of highlight-reel goals in the second period. He scored his first when he spun around Bruins captain Zdeno Chara and wristed a shot past surprised goalie Tim Thomas 8:20 into the period. "If he (Kovalev) doesn't have any votes for MVP, I will be really upset," Canadiens coach Guy Carbonneau said. "We are at the top of the conference and he is a big part of it." He victimized Chara again along with Dennis Wideman as he deftly maneuvered between the defenseman and slid a soft shot through the Thomas' pads at 13:21. Chara was a game-time decision and returned to the lineup after missing five games with an upper-body injury. Mark Stuart cut the Canadiens' lead in half 27 seconds after Kovalev's second goal when his shot from the blue line ricocheted past Price. Stuart took advantage of a pass off the stick of Shane Hnidy, who made a diving play at the blue line to prevent a clearing attempt by Montreal. Michael Ryder scored an insurance goal 6:37 into the third period when he converted a perfect feed from Saku Koivu to give Montreal a 3-1 lead. Sergei Kostitsyn capped the scoring for Montreal with 8:47 remaining. Wideman brought the Bruins back within two goals with 3:05 left in the game, but Boston fell to 2-5-3 in its last 10. "I can't put the puck in the net for the players," coach Claude Julien said. "Somewhere in that dressing room someone has to have goals in them." The seventh-place Bruins are clinging to a playoff position but are only two points ahead of Buffalo, which is on the outside of the postseason race. Both teams have eight games remaining. Notes: Kovalev has seven goals and four assists, and Mark Streit has 10 assists against Boston this season. ... Montreal D Andrei Markov, tied for second on the team in points, is scoreless in the past six games. ... The Bruins haven't scored more than three goals in 11 straight games. ... Montreal's Mike Komisarek left in the first period with a lower-body injury and didn't return.